No, your axle is not upside down...you need to rotate it clockwise (looking from above) 180 degrees, so that you have the zerk fitting on the right behind the axle. I will try to add a photo if I can find a good view. Peter has it, but it may be a tad confusing with the other parts in there. It does show the zerk though, just in front of (above in the photo) the bolt holding the white receiver/tie down. This is the first photo I came across...hope it is clear enough after I zoomed in and cropped it then resized it!! Rjpoog1989 wrote: My Grease zerks is up and on the left, so the axle is upside down, not backwards as I originally suggested. I don't want to disagree Dale, but I think the center section of the front axle is upside down, and backwards, that is, facing 180 degrees the wrong way. If the whole axle assembly was simply facing 180 degrees the wrong way, the center grease fitting would still be pointing down. It looks like it is in the wrong position forward to back, the longer part of the pivot tube is in the front, putting the whole axle back too far. The tube is not in alignment with the upper stops, cast into the steering housing. At least it looks like it in the pics. It is hard to tell in a pic, without being there. I may be wrong, but assemble everything like in the manual, and it should be right. Below is a pic showing the axle tube in alignment with the upper stop, and the grease fitting at the lower right side. The pivot tube, where the shaft is, is longer at the rear, moving the axle ahead. Last edited by Glen on Sun Feb 11, 2018 7:52 pm, edited 1 time in total. Upside down, inside out, it’s very hard to describe. I’ve got it in there the correct way now and have both tie rods in the same setting. I need to read up on the alignment procedures, but I’ve got it damn close. I did widen the front track by one setting to match the rear and give the tractor more stability. Good you are getting it fixed. Yes, it is a little hard to describe the direction the axle was. It looks like in your pic someone has drilled the parts all the way through, and put in a bolt. I don't know if that fits tight, you could get some steering play there if the holes have worn, or were not tight at first. 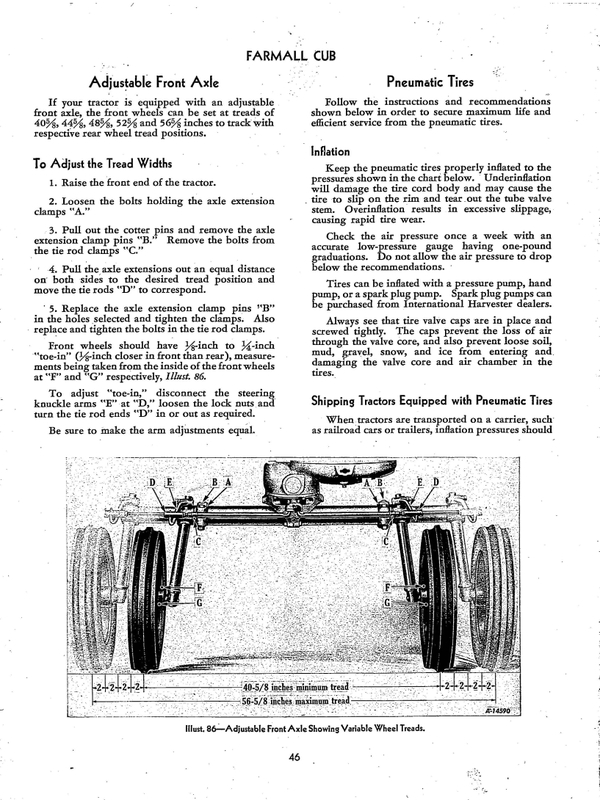 Below is a page from the 1949 Cub owner's manual showing how to adjust the front wheel toe in. The measurements have to be at the same area of the wheels, at the front and rear of the wheels, like it shows in the pic. Be careful when tightening the screw in adjustments at D in the pic above, the balls on the steering arms usually wear more in the straight ahead position, so they are slightly smaller there from the wear. If you tighten the screw adjustment tight with the steering straight ahead, it will bind when you turn the steering wheel to the sides. I like to jack up the front slightly, so the steering wheel turns freely, and turn it both ways fully, and be sure there is no binding. You will have to loosen the screw adjustments just enough that it turns freely side to side, if it binds. Then it is a little loose in the straight ahead position. That is how they are with wear there. Last edited by Glen on Thu Feb 15, 2018 1:41 am, edited 1 time in total. Glen wrote: . . . You probably need another person to hold a tape measure at one wheel, while you read the tape at the other wheel. . . .
Use a pair of yardsticks. Take the reading where they overlap. Replacement for spring on snow plow? Snow Plow from numbered series on a '57?